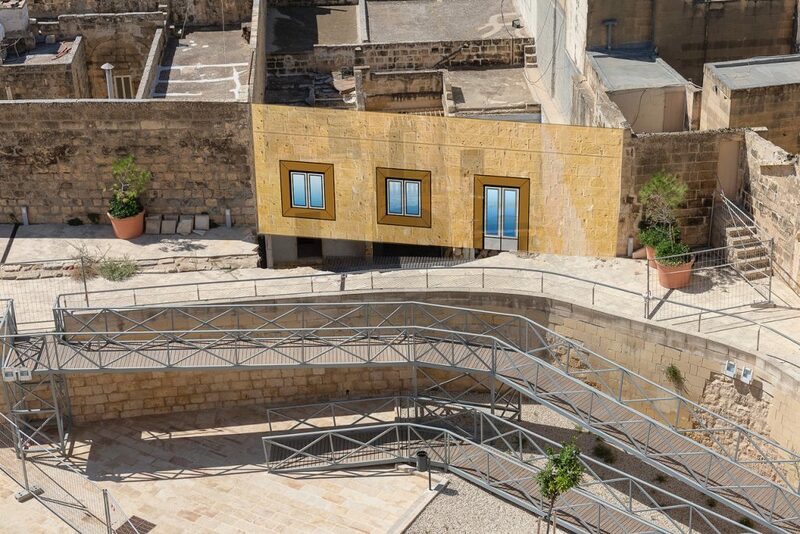 The Victoria Local Council and Wirt Għawdex are pleased to note that the repair work on the collapsed wall at the Ċittadella ditch in Victoria, Gozo is progressing and the wall is being rebuilt. However, the local council and NGO regret that the controversial two windows and doorway overlooking the ditch will again be established since the original permit has not been amended to omit these apertures, notwithstanding the damage they have created. The Victoria Local Council makes it very clear that, since the ditch belongs to the Government (Lands Authority), it is only the Lands Authority that can submit an objection about these apertures. The Local Council has carried out its responsibilities as the lessee and advised and made its objections, before the wall collapsed, to the Lands Authority as the responsible entity for Government property. The Lands Authority confirmed to the Council that no such permission was ever granted. However, the granting of servitude (making openings in a dividing wall) always needs to be approved by the owner and yet, the Planning Authority did not receive or request the developer to present such permission during processing of the application. It is also worth noting that originally, the Superintendence of Cultural Heritage strongly objected to these apertures. All the reasons they quoted for these objections are still relevant today. The Victoria Local Council and Wirt Għawdex are therefore strongly recommending that the above-mentioned permit be amended accordingly by the Planning Authority by removing these apertures from the permit. Il-Kunsill Lokali tal-Belt Victoria flimkien ma’ Wirt Għawdex jinnutaw b’sodisfazzjon li x-xogħol ta’ tiswija fuq il-ħajt li ġġarraf fil-Foss taċ-Ċittadella fir-Rabat Għawdex miexi ‘l quddiem u l-ħajt qed jerġa jinbena mill-ġdid. Madanakollu, l-Kunsill Lokali u l-Organizzazzjoni mhux Governattiva jinnutaw b’dispjaċir li l-ftuħ ta’ żewġ twieqi ġodda u ta’ bieb li jagħtu għal fuq il-Foss ser isiru mill-ġdid peress li l-permess oriġinali ma ġiex emendat biex jitneħħew dawn l-aperturi, minkejja l-ħsarat li kkawżaw. Il-Kunsill Lokali tar-Rabat Għawdex jagħmilha ċara li, peress li l-Foss jappartjieni lill-Gvern (Awtorita’ tal-Artijiet), hija biss l-Awtorita’ tal-Artijiet li tista’ tissottometti oġġezzjoni dwar dawn l-aperturi. Il-Kunsill Lokali wettaq ir-responsabbiltajiet tiegħu bħala l-inkwilin u ressaq il-proposti u l-oġġezzjonijiet tiegħu qabel waqa’ l-ħajt, ma’ l-Awtorita’ tal-Artijiet bħala l-entita’ responsabbli mill-propjeta’ tal-Gvern. L-Awtorita’ tal-Artijiet ikkonfermat mall-Kunsill Lokali li ma ħarġet ebda permess f’dan ir-rigward. L-għoti tas-servitu’ (li jinfetħu aperturi f’ħajt tad-diviżjoni għal fuq propjeta’ ta’ terzi) dejjem trid tiġi approvata mis-sid, madanakollu, l-Awtorita’ tal-Ippjanar ma rċevietx u lanqas talbet lill-iżviluppatur biex jippreżenta tali permess matul il-proċess tal-applikazzjoni. Ta’ min jinnota li oriġinarjament, is-Sovrintendenza tal-Patrimonju Kulturali oġġezzjonat b’mod qawwi kontra dawn l-aperturi. Ir-raġunijiet miġjuba għal dawn l-oġġezzjonijiet għadhom validi sallum. Il-Kunsill Lokali tar-Rabat Għawdex u Wirt Għawdex qegħdin jirrakkomandaw b’mod qawwi li l-permess msemmi jiġi rivedut mill-Awtorita’ tal-Ippjanar billi jitneħħew l-aperturi msemmija mill-permess approvat.